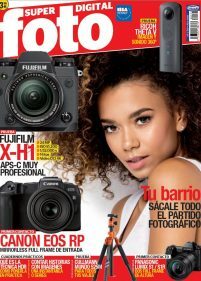 Super Foto Digital was launched in 1996 by editorial Grupo V. The magazine is aimed at amateur and enthusiasts that like the photography to help create good pictures. Super Foto Digital publishes tests new product the cameras, lens y other photographic accessories such as printers, tripods, camera bag, filters… Also publishes articles about photographic techniques, practical sections, useful hints and ideas, post-processing of image, written by professional, also interview and publishes pictures of the leading photographers and young Spanish promises. The magazine Super Foto Digital is member of prestigious European EISA association from 2009. EISA, allows us to exchange experiences with other photography magazines Europeans and exchange opinions about the new products for that our audience have the best info.